A new engine – assembled by Choice Mechanical in Toowoomba – has been pieced together with a view to producing big horsepower with total reliability. The bottom-end features a brand new crank, Crower rods, ARP rod bolts, JE forged pistons and Total Seal rings. 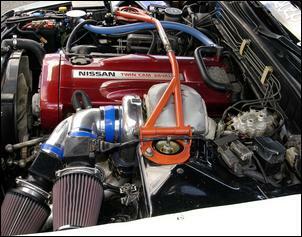 A Nismo oil pump, baffled sump and oil catch can are fitted as insurance. At present, the DOHC cylinder head is a reconditioned stocker with upgrade Tommei camshafts, adjustable sprockets and firmer valve springs. Craig says he’ll soon look into further valvetrain improvements to accommodate high rpm operation. A friend of Craig’s – Kyle Hopf – can be awarded for his fabrication of a custom tubular exhaust manifold. The custom manifold mounts a gigantic T66 ball-bearing turbocharger (complete with turbine heat bag) and 52mm XTR external wastegate. That T66 turbo blows into an ARE front-mount bar-and-plate intercooler that’s installed with custom plumbing fabricated by Kyle. A GReddy Type R blow-off valve recirculates air back to the pre-compressor intake pipe. 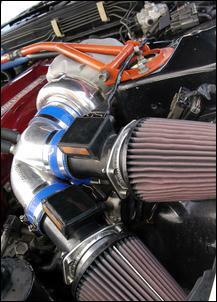 A GReddy Y-shape inlet pipe takes induction air from a pair of K&N conical filters and funnels it into the single turbo mouth. At the opposite end of the turbo, exhaust gases belch though a custom dump pipe and 5Zigen 3½ inch system that came fitted to the car. Craig will soon switch to a 4 inch single or twin pipe system. Craig decided against a wire-in programmable management system in preference to a plug-in A’PEXi Power FC unit. This gives full control of fuel and ignition and has been rescaled to suit a pair of big-bore Z32 300ZX airflow meters. Injectors are 750cc jobs feeding from an aftermarket rail with a rising rate regulator. At the opposite end of the fuel system you’ll find a pair of parallel Bosch 044 pumps kept in supply by a surge tank. 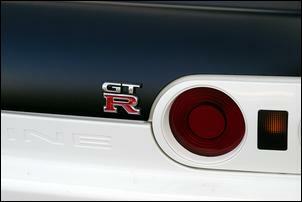 A standard GT-R pump feeds the surge tank. 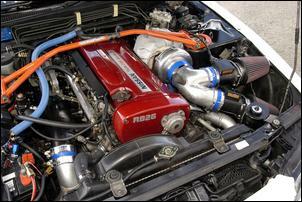 With Power FC tuning performed by Matthew Spry on the Gold Coast, Craig’s R32 GT-R can churn out 520hp (388kW) at the rear wheels on a Dyno Dynamics chassis dyno. This is achieved with a GReddy dual solenoid boost controller set to 28 psi and 98 RON pump fuel in the tank. 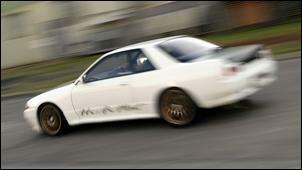 At the time of writing, Craig hasn’t taken the car down the quarter mile. Understandably, he’s reluctant to shatter the gearbox - but Craig has another interesting driveline up his sleeve... He intends to fit a comprehensively tricked-up automatic transmission from the Skyline GTS-4 (AWD) and experiment with stall converters. Some changes to the existing Tein coil-overs may also be necessary for drag racing applications. With the auto transmission fitted, Craig is planning on running a 10 second quarter mile pass. And once that target is met (which shouldn’t be long) he’ll switch to a bigger turbocharger, upgrade the valvetrain and shoot for high 9s. Craig is confident of cracking a 9 second ET even though he’s currently in the process of installing a big, hefty sound system. As a joint owner of Toowoomba’s Hi-Fi Mart and HFM Auto Styling, Craig has a priority to get his GT-R up an’ running with a high-end audio set-up. He doesn’t plan a window-rattling system – he prefers something that delivers top sound quality. 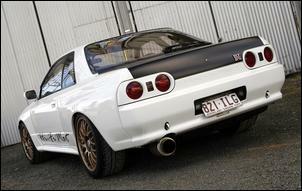 The R32 GT-R body is currently standard except for removal of the standard rear wing, a black boot lid and some promo signage. 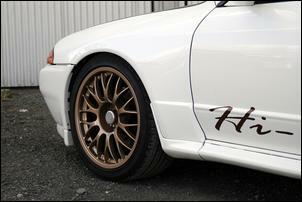 Craig will be moulding a unique drift-style body kit to suit R32s – a product you can expect to see sold through HFM Auto Styling. Wheels are attractive BBS 18s wearing 265/40 tyres. At the time of writing, Craig is preparing one of his other hi-po machines for sale – a BMW 535i with a custom turbo kit, Getrag gearbox and 12 grand audio system... His business partner, Warwick, is nibbling pretty hard at the Beemer and if all goes to plan Craig will soon have some extra cash to splurge on the GT-R. The afterlife keeps getting better and better for this machine! Craig would like to thank his mate Kyle and Troy from Choice Mechanical.